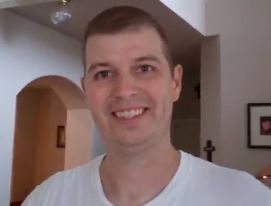 "I just wanted to get through it. I have never been so nervous because I hadn't run a 400m in so long. I always miss this part of the season. So for me to just be in the race, I am just happy that I am fit at this time ... to actually get a chance to run at this part of the season is very good and is a good sign for the rest of the year." - Usain Bolt talking about the season opening 400 he ran in Jamaica this past weekend. He won his heat in 46.74, but lost to Warren Weir (46.23) and Yohan Blake (46.64) in the overall results as they went 1-2 in another heat. 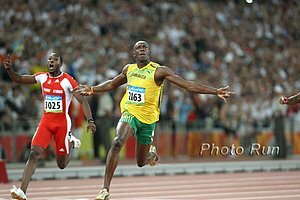 It was Bolt's first 400 since February 2010 when he ran 45.87. 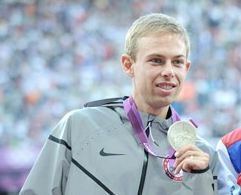 Symmonds "runs" near 10 min/mile pace? 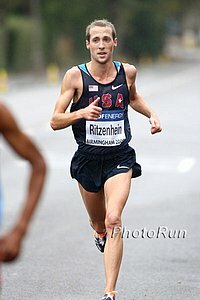 Dathan Ritzenhein To Run 2013 B Of A Chicago Marathon It's only February, but that doesn't mean marathoners aren't thinking ahead to paydays in the fall. After running a track season, Ritz hopes to improve on his 2:07:47 last year in Chicago, which made him the #3 all-time US performer. 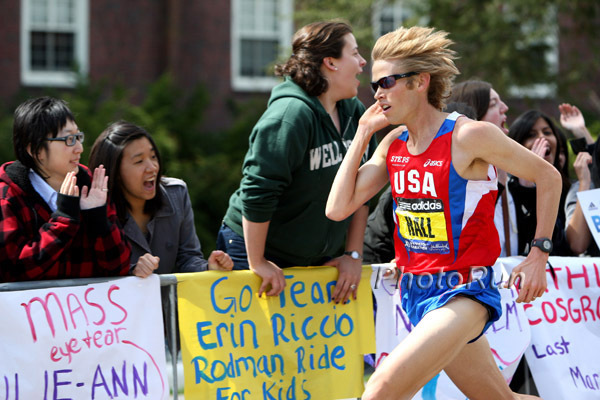 And to show how tough marathoning has become, that only put Ritz 9th in the race. *Nick Symmonds Blogs On His "Running Bucket List" Many LRC's will have beaten him to two on the list as he has yet to run a marathon or a fun-run 5k. 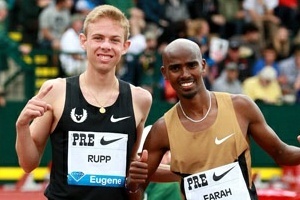 Other US News: Will Obama Talk About Running Today? American College of Sports Medicine Wants The President To Encourage Exercise In His State Of the Union Address Sign the petition here. Jeremy Taiwo And Aurieyall Scott Are USTFCCCA Athletes Of The Week Taiwo set the heptathlon HJ WR at 7-4½ and scored 6,156 points overall which makes him 3rd best in collegiate history (7th best US history) behind Ashton Eaton and Trey Hardee. 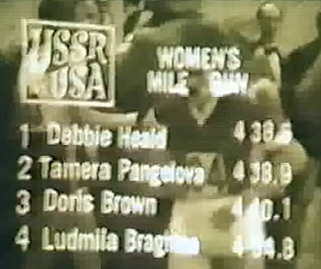 Scott set the World Lead in the 200m as she beat out Bowerman award winner Kimberly Duncan. RIP: Message From Stephanie Hightower On The Passing Of USATF Board Memeber Kim Haines Hightower: "Kim had been involved in USATF for longer than most of our members have been alive." 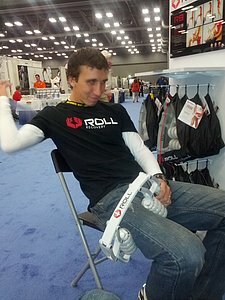 *Good Video Interview With Chris Solinksy Talking A out His First Time On The Track Since 2011 (He Rabbitted The Mile) "I think I'm in about as good a shape as I was in freshman/sophomore year of college right now." *Post-Race Video With Ryan Hill, Who Says He Wasn't Happy The Top Competition In The 3k Was Split Up Into 2 Heats. Estrada agrees and was also disappointed he didn't get to race Hill. 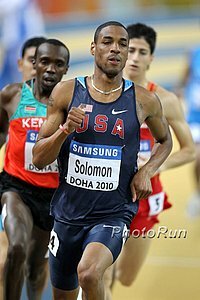 The Week That Was In Running: February 4 - February 10, 2013 This week we wonder, 'Can Nick Symmonds really move up to the 1,500? 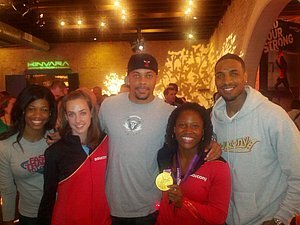 ', LetsRun.com goes to Japan, JK is confirmed to be a genius (yet again), and we wish that Nike would sponsor a "Just Do It Fairly" campaign. Along the way there is talk of Matt Tegenkamp, Dathan Ritzenhein, Al Sal, Mary Cain, Galen Rupp, German Fernandez, Robby Andrews, Leo, Centro, Wheating, Tyson Gay, Dorian Ulrey, Rich Kenah, Sam Mackenzie and Nick Wade. Is World XC Doomed? Even The Kenyans Don't Wanna Go: Defending World Junior XC Champ Geoffrey Kipsang And Former World 5k Champ Eliud Kipchoge Pull Out Of Saturday's Kenyan XC Champs/World Trials Kipsang is racing the Ras Al Khaimah Half Marathon on Friday instead and Kipchoge is focus on races on the road saying, "Many senior athletes are looking at the monetary value in the event compared to the road races and it is logic for them to jump ship.” Previously announced, defending World XC champ Vivian Cheruiyot and defending runner-up Linet Masai won't be competing. International: Bolt Says He "Has Never Been So Nervous"
Usain Bolt Happy With His 400 Season Opener: "I just wanted to get through it. I have never been so nervous because I hadn't run a 400m in so long," He said he'll probably race a one or two more 400's later this season. Aussie LJ Silver Medalist Mitch Watt Pulls Out Of Weekend Meet With Ankle Injury He was supposed to have a 100m showdown with Australian national champ Josh Ross. Ireland's Former World Silver Medalist Race Walker Olive Loughnane Retires Loughnane said, “Ten years ago people thought there was no difference between what we were doing and a person walking to the shop." ... But today we all know the difference is walking to the shop actually serves a purpose. West Ham United Moves A Step Closer To Securing Olympic Stadium Deal As They Reached An Agreement With London 2012 Legacy Chiefs On A Major Issue The big debate was Mayor Boris Johnson wants a cut of any profit if West Ham were sold and it seems West Ham has conceded. Flanders: IAAF Recap: Recent XC Star Albert Rop Won A Close 3k In 7:39.59 Over 7:54 Steeplechaser Paul Koech (7:39.75) & Ayanleh Souleiman (7:39.81) Daniel Kipchirchir Komen and Mekonnen Gebremedhin were 4-5. Abraham Rotich won the 800 in 1:46.75 as Angel David Rodriguez won the 60m with Christophe Lemaitre in 4th. In the 400 Ireland's Brian Gregan beat out Belgium's Jonathan Borlée and Olympic silver medalist Luguelín Santos. 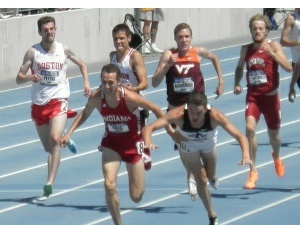 The other Borlée twin, Kevin, lost to Czech Republic's Pavel Maslak in the 300. 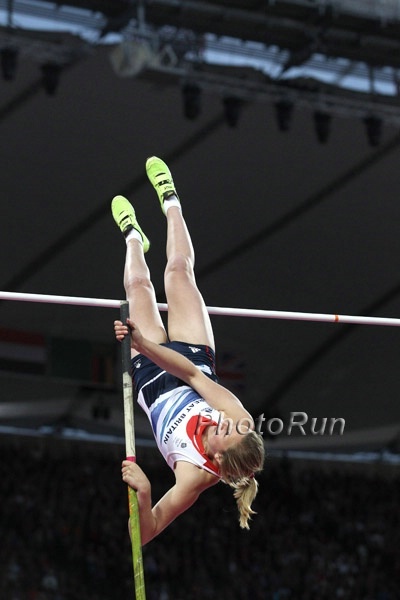 In the women's HJ, 2008 Olympic champ Tia Hellebaut lost to Italian teenager and world leader Alessia Trost. Q&A With Elite Marathoner Manager Jos Hermens, Who Manages Haile Gebrselassie And Stephen Kiprotich Hermens: "I understand that there are 80 million people living at high altitude (in India), so there must be good talent in these areas. 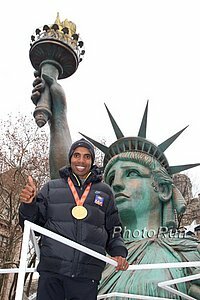 I am convinced that in future, with right scouting and training, Indian marathoners will be running 2:10, but it will take some years." Tuesday In France: Val de Reuil Meet Features Olympic Steeplechase Silver Medalist Mahiedine Mekhissi-Benabbad In The 1,500 & Christophe Lemaitre In 60/200 60m world leader Murielle Ahouré will be up against Bulgaria's European 100m champ Ivet Lalova. IOC Will Drop One Sport From The Summer Olympics ... Who's It Gonna Be? Those at risk are modern pentathlon: Taekwondo, wrestling, badminton and table tennis. Baseball/Softball, Climbing, Karate, Roller Sport, Squash, Wakeboarding & Wushu (???) All Making Their Case For Inclusion Into The 2020 Games Golf and rugby have already been added for 2016. Modern Pentathlon Is The Favorite To Be Axed, But Wrestling Also At Big Risk Fun Fact: Famed distance coach, Jack Daniels, won two Olympic medals in modern pentathlon.